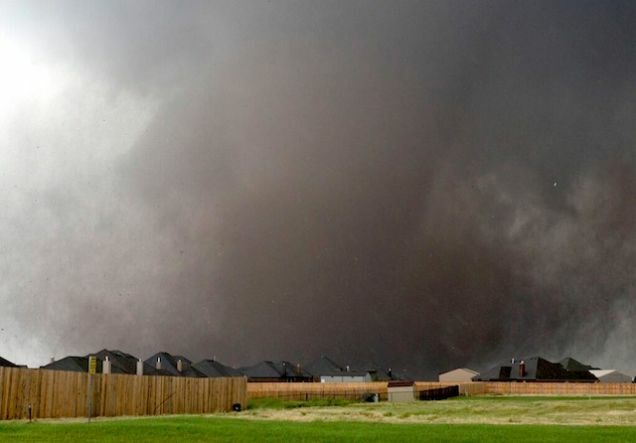 A massive, mile-wide tornado touched down in Moore, Oklahoma Monday afternoon, killing at least 51 people, including 20 children. 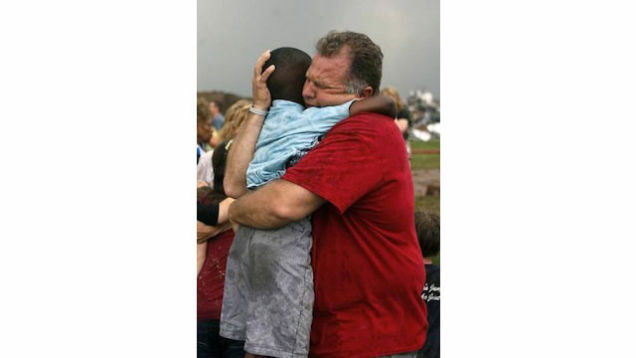 A reporter from local news station KFOR supposedly called it "the biggest, most destructive tornado in the history of the world," and estimated it was two to three times the magnitude of the massive tornados that hit Oklahoma in 1999. 12:51 AM EST: CNN is reporting that 40 additional bodies are being taken to the Oklahoma state medical examiner's office, bringing the death toll to 91. 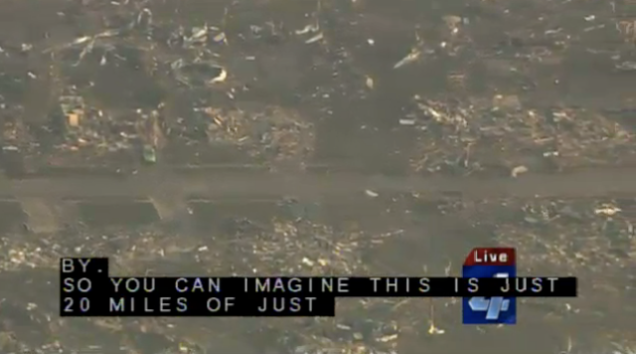 12:20 AM EST: A video showing the devastation in Moore after the tornado. 11:40 PM EST: President Obama has signed a major disaster declaration for Oklahoma. 11:23 PM EST: This is reportedly video of a family emerging from their storm cellar after the tornado. 11:07 PM EST: Here's video of the tornado as it lands near Moore, Oklahoma. 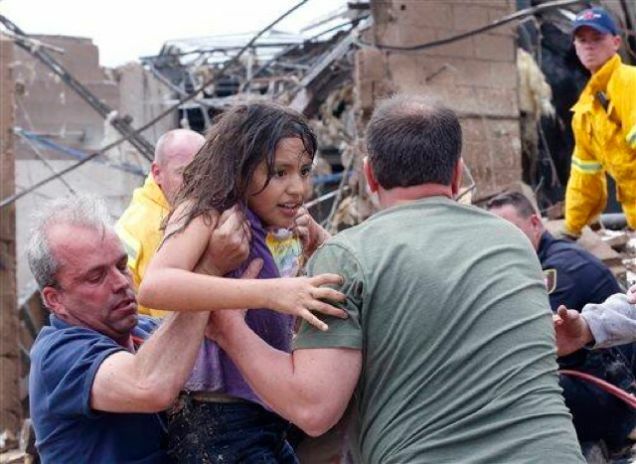 10:40 PM EST: CNN is now reporting that 20 children were killed in the storm. 10:33 PM EST: Local hospitals report at least 145 injuries, 70 of them children. Of the 51 confirmed deaths, seven were children, according to an Oklahoma City police spokesperson. Those numbers are, unfortunately, expected to rise. A spokesperson for the Oklahoma City medical examiner reportedly told Fox News that she's expecting the bodies of 20 children. Below: a photo of volunteers searching for survivors. 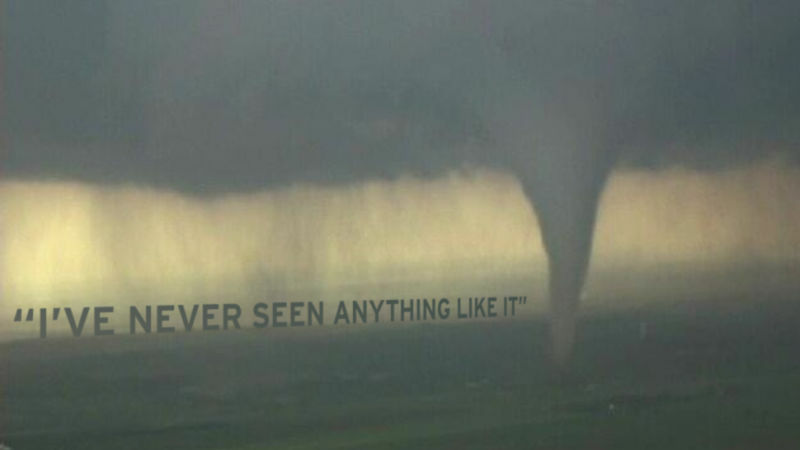 10:02 PM EST: This is reportedly a photo of the tornado as it hit Moore. A photo students being led to safety from Briarwood Elementary. 9:22 PM EST: Another photo of the damage, from ABC News' Ginger Lee. 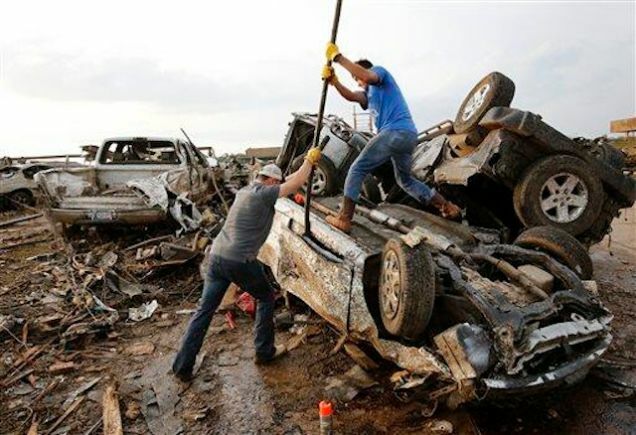 9:09 PM EST: The Oklahoma state medical examiner's office is reporting at least 51 killed, including several children, according to the Associated Press. 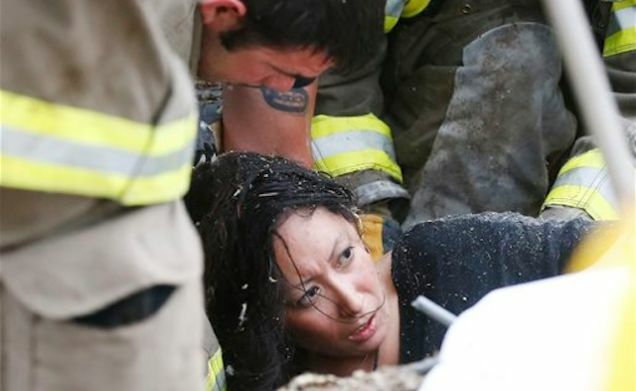 Below a woman is rescued from the debris at Plaza Towers School. And a teacher hugs a student outside of Briarwood Elementary School. 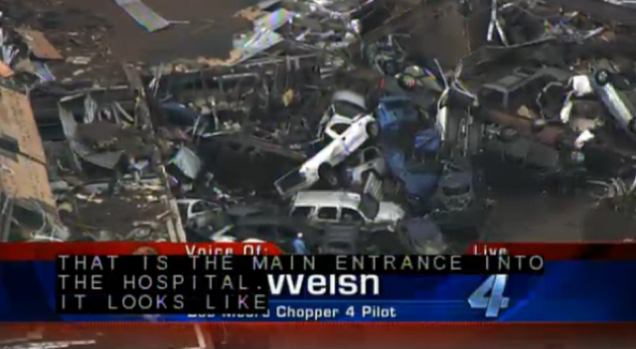 8:55 PM EST: KFOR footage shows entire neighborhoods rendered unrecognizable. 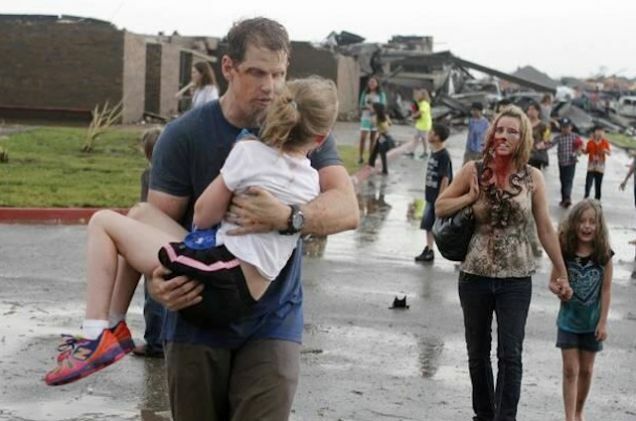 8:53 PM EST: The AP is reporting that more than 120 tornado victims, including around 70 children, are being treated in local hospitals. 8:49 PM EST: Interested in knowing why the American Midwest gets so many tornadoes? Here's the science. 8:36 PM EST: KFOR meteorologist Mike Morgan called today's storm a "worst-case scenario," saying it "went from nothing to an F-5 in less than an hour." Morgan calling this an F-5, the largest kind of tornado, goes against the National Weather Service's classification of it as an F-4. Morgan also said the storm was two and a quarter miles wide. 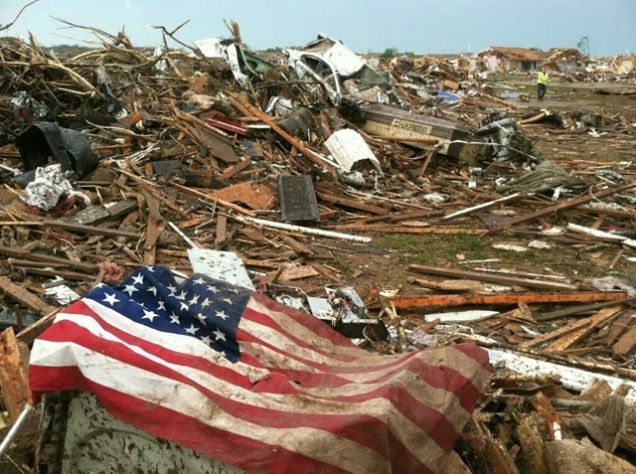 8:30 PM EST: President Obama has told FEMA to ready itself to assist Oklahoma with its recovery. 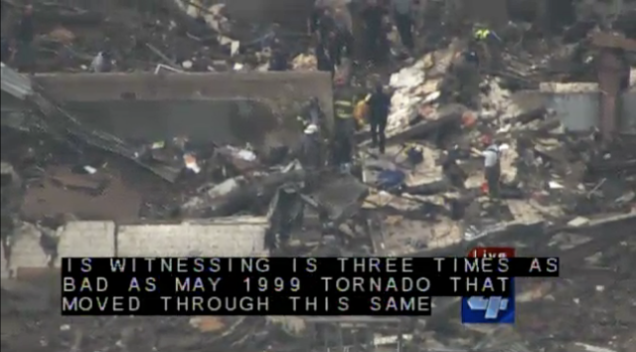 8:25 PM EST: The Oklahoma City medical examiner is reporting at least 37 killed, according to NBC. 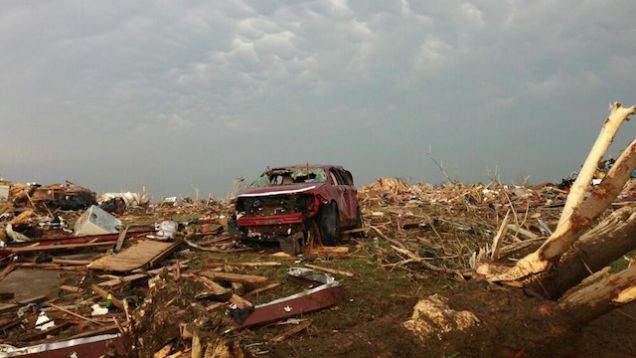 Glenn Lewis, mayor of Moore, Oklahoma, described his city as looking like "a debris field." 8:00 PM EST: KFOR reports that seven children have been found drowned in Plaza Towers Elementary School and as many as 30 others are elsewhere in the rubble. 7:55 PM EST: The National Weather Service has issued an early finding that today's tornado was an EF-4, the second most powerful classification on the enhanced Fujita scale. CBS News has put together a rundown of history's largest tornadoes to give some context to that rating. 7:53 PM EST: Authorities are racing to complete as much of their recovery efforts as possible before night falls, which will severely impede their abilities. 7:46 PM EST: KFOR's meteorologist estimates that today's storm was roughly three times the size of the May 3, 1999, storm that previously damaged swaths of Oklahoma. 7:39 PM EST: KFOR reports that authorities are now looking for two dozen children amid the wreckage at Plaza Towers Elementary School. The mission has changed from "search and rescue" to "search and recover." 7:32 PM EST: Oklahoma Governor Mary Fallin has reportedly dispatched 80 National Guard service members to assist with rescue efforts. 7:29 PM EST: KFOR reports that "dozens" are currently seeking medical attention in area hospitals. There are still only six confirmed deaths, but that number is expected to rise. 7:13 PM EST: A heroic teacher at Plaza Towers Elementary School reportedly threw her body over several children in an effort to protect them as the storm struck a direct blow on the school. 7:05 PM EST: The National Weather Service has confirmed that winds in Moore this afternoon got up to 200 miles per hour, according to KFOR. 6:55 PM EST: KFOR is reporting just four fatalities right now: Three adults and an infant reporter Meg Alexander saw pulled from the rubble of a building. 6:45 PM EST: KFOR is now reporting that the storm could have been more than two miles wide at its largest. 6:41 PM EST: Oklahoma City police tell the AP that downed power lines and open gas lines pose risks in the storm's aftermath. 6:10 PM EST: CBS News now says that the tornado was a full mile-wide and that local hospitals are reporting "multiple deaths." 6:07 PM EST: KFOR's Lance West reports that the storm laid to waste at least two schools, a movie theater, and a mobile home park. One of the schools, Plaza Towers, was said to be housing 75 students in its south wing when the storm hit. Emergency teams are now digging through the debris looking for survivors.